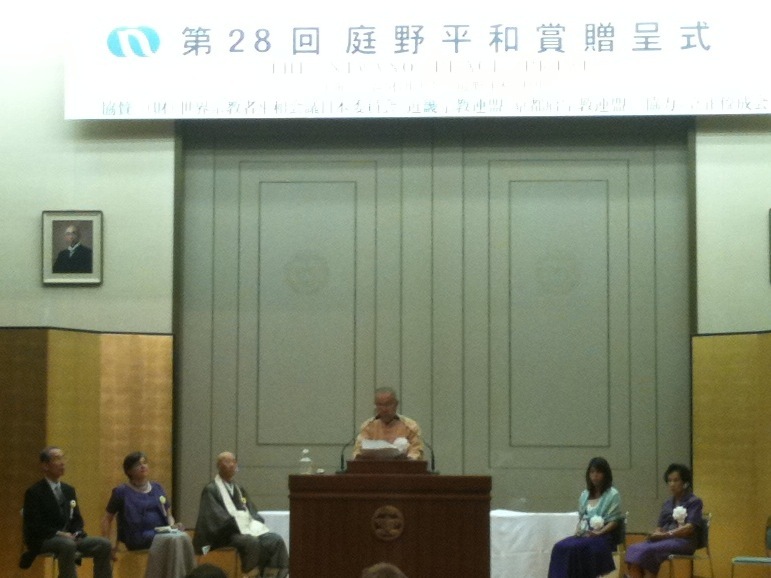 The Niwano Peace Prize International Selection Committee decided to award the 28th Niwano Peace Prizeto Sulak Sivaraksa, a remarkable and multifaceted Buddhist leader whose work for peace is exemplifiedby courage, determination, imagination, and the constant inspiration of the core principles of his Buddhistfaith. Sulak has helped to change the views of political leaders, scholars, and young people, in Thailand,Asia, and the world, encouraging a new understanding of peace, democracy, and development. Hechallenges accepted approaches that fail to give priority to poor citizens, men and women alike. He has,over a lifetime of dedicated service and unflagging commitment, given new life to ancient Buddhistteachings about nonviolence and about peace and justice. Sulak Sivaraksa was born 1933 in Siam (as he prefers to call his country), to a family of Chinese ancestry.Educated in Thailand, England, and Wales, in law and other disciplines, he returned to Bangkok in 1961.Sulak?s long career has seen him using his intellectual gifts to propel the concept and movement ofEngaged Buddhism. Sulak has worked as a teacher, scholar, publisher, activist, and founder of many organizations. He hasauthored more than a hundred books and monographs, in Thai and English. A teacher throughout hisadult life, he promotes a spiritual education movement grounded in traditional culture and values. It is amark of Sulak?s approach that he has nurtured and supported younger leaders over the years. Many todayare leaders of a wide range of organizations. Sulak has always been an activist and never hesitates to speak truth to those in power. To serve societytruly, Sulak contends, one must stay in touch with poor people and the grass roots. Working to bringabout change has embroiled him in many controversial issues. He aproaches advocacy with a combinationof knowledge, courage, and absolute commitment to nonviolence. He is widely credited with havingmobilized Thai civil society, creating many social welfare and development organizations. All embodytwo central themes of his work: rejection of consumerist development, and pursuit of development rootedin indigenous culture and socially-engaged religious traditions and beliefs. His organizations reflect anindigenous, sustainable, and spiritual model for change. Today, these organizations are active far beyondThailand. Sulak combines his insights into politics and spirituality, well aware of the importance of politics forBuddhism, but never straying from the central role of spirituality. He has been in jail many times, due tohis critical approach to numerous political and social issues and protests. He appreciates that political andinstitutional change are needed to achieve peace and justice. Sulak?s intelligent advocacy for the environment is another important reason to honor Sulak. He speaksforcefully against environmental destruction, promoting environmental preservation and environmentaljustice. Sekhiyadhamma (Students of the Dhamma), a network of Buddhist monks, works in theircommunities to preserve local environments, principally forests that are so essential to village economies.Characteristic of Sulak?s approach, the work combines education, teaching villagers better ways toconserve natural resources, and political action to protect local social, cultural, and natural environmentsfrom the encroachment of commercial, industrial, and urban development. Sulak?s environmental ethic isgrounded in a holistic understanding of the Buddhist principle of interdependence and a deep respect fornature. Knowledge of inter-becoming (a term he borrows from Thich Nhat Hanh), is achieved bydeveloping mindful awareness. In contrast to more reflective and contemplative styles, he aggressivelyfights in the trenches for the cause of human and environmental justice. Sulak uses the principles and practices of Buddhism as a personal and political resource. His life showsthat the interior life of spiritual contemplation, and the exterior life of political action, need not be seen asopposites or hostile to each other. On the contrary each can be used to illuminate and inform andencourage the other. He is a living example of simplicity, loving kindness, and compassion. Selflessnessis at the heart of Sulak?s universal vision. Sulak extends the Buddhist Five Precepts into ethical guidelines that can forge a more sustainable,compassionate, and just global society. To refrain from killing today means an end to all modern formsof violence. To refrain from stealing is a call for global economic justice. Not engaging in sexualmisconduct calls us to examine all systems of male dominance which exploit women. Prohibiting falsespeech is a call for honesty at the international level. Avoiding intoxication is a call for globalresponsibility for drug and alcohol use and an examination of its causes. In Sulak?s Buddhist vision ofsociety, the individual is understood as a starting point for change: through individual spiritual growth,social justice is eventually achieved. Sulak is a leading voice in global inter-religious dialogue and engagement, an acknowledged globalleader for peace. Sulak always argues that interdependence is an essential, living concept. His is a voiceof reason and ethics, speaking truth to power and highlighting tangible issues that touch on human dignity.He was one of the early leaders who brought the ethical challenges of caring for the environment intoglobal discourse. His voice carries far and has influenced thinking at many levels. This is reflected inadmiration and recognition of his work, including the 1995 award of the Right Livelihood Award, alsoknown as the alternative Nobel Prize. Sulak sees Buddhism as a questioning process. Question everything, including oneself, look deeply, andthen act from that insight. He is among a handful of leaders world-wide working to revive the sociallyengaged aspects of spirituality. Whatever he does, however he does it, at the core of his work is a missionto build a new leadership for change at all levels, within his country and beyond.